Are you planning to move into a studio apartment? If so, you're not alone. In recent years, tiny homes and "tiny living" have become a growing trend. Some downsize to be more environmentally friendly, while others desire more time and freedom. Others opt for a smaller home for financial reasons. This is no surprise, considering that 76% of Americans live from paycheck to paycheck. Living in a studio apartment is a logical approach to spending less and saving more. Whatever your reasons for moving into a studio, you likely have some concerns about how to best use the reduced space. Here are our suggestions for living comfortably in your studio apartment. Whether your studio apartment is 200 square feet or 500 square feet, you can optimize the space by trying different layouts. If your dining table feels awkward by the kitchen, try placing it under the window. Keep playing around with different layouts until you find one that feels comfortable and is easy to walk through. Remember there are no hard and fast rules, either. Just because your studio has a separate room for a bedroom, doesn't mean the bed needs to be in there. Try making that area your living room. Move your bed into the main part of the studio. Since you'll probably do a lot of rearranging, it's best to choose furniture that's easy to move. If you're downsizing from a house, it may feel strange to have your bed, couch, kitchen, and dining table all in one room. One way to help "break it up" is to make each area feel distinct. Create a room within a room. Do this by orienting your bed with the dressers and your couch with the coffee table. Or, try backing your couch to your bed's headboard so they face opposite directions. Mirrors are a terrific way to create space and to make a room feel larger. If you had a favorite item from your old bedroom or living room, use it in your studio. This will help to make the space your own. You'll probably have to get creative with storage in your studio apartment. One of the easiest ways to do this is to sse furniture and kitchenware for more than one purpose. No place to store your surfboard? Turn it into a piece of artwork. No room for a TV stand? Place it on top of your dresser. Not enough storage for all your glassware? Buy some elegant glass tumblers that you can use for water, wine, cocktails, or soft drinks. Another expert tip? Get a magnetic strip for your kitchen knives to free up valuable counter space. Do you have too many items you love and not enough room to display them? One solution is to swap out your decor with the seasons, or whenever you feel you need a change of scenery. If you have lots of sentimental items, leave a few out and keep the rest tucked safely away. When the mood strikes, change up the decor. Even though the items aren't new, their familiarity will help your studio feel more like "home." A common concern for those living in studio apartments is whether or not to have company over. Where will everyone sit? Where will everyone eat? While you may not be able to fit fifty of your closest friends into your studio, there's no reason you can't entertain a few. Your friends may surprise you with their willingness to sit on the couch, cushions, or even the floor. If space allows, you could even invest in a few folding stools or chairs to use when you have people over. This is a great opportunity for you to share what you love about simple living. If you're renting your studio, you can also tout the benefits of renting over owning a house. Your sleeping arrangements, of course, will depend on who's living in your apartment. If it's just you, you'll have a little more flexibility than sharing the space with your spouse, child, or roommate. 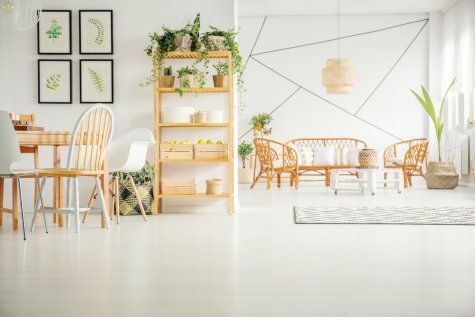 Some modern furniture stores gear their products specifically towards small spaces. If you shop around, you may be able to find ready-made loft beds that fit above a desk or sofa. If the ceilings are high enough, you may be able to carve out or build a sleeping loft. And if you're sharing the space with a roommate or child, you can't go wrong with old-fashioned bunk beds. Your windows are key to making your apartment feel larger. Highlight them by choosing light, airy curtains that allow plenty of natural sunlight to seep through. Choose white or light-colored curtains or, for a more modern feel, skip the curtains altogether. Closet doors can be bulky and make navigating small spaces difficult. Ask your landlord if it's possible to remove the closet doors and store them. Then you can hang a simple curtain to hide the contents instead. Big, bright patterns may make a small apartment feel even smaller. The same is true of very dark bedding or upholstery. Give your studio apartment a bigger, airier feel by choosing light, solid decor. Whites, pastels, or neutral tones will create a sense of cleanness and openness. If you feel the need for more color, choose a bright accent piece or two. This could include decorative pillows, a flower-filled vase, or a favorite painting. Living in a small studio doesn't have to mean sacrificing comfort. With a little ingenuity, you can create a beautiful, elegant home in even the tiniest studio apartment. Are you currently looking for an apartment, town home, or house to rent? Wherever your next move is taking you, we've got plenty of great properties available. We invite you to browse our apartment classified ads to find the one that's right for you!